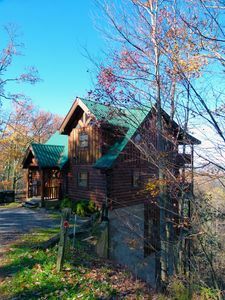 Hearts Ease is a sister cabin to Lee's Log Cabin and A Private Affair which are located nearby. 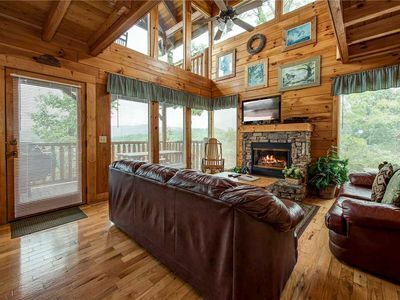 This is an authentic log cabin located in Pigeon Forge close to Dollywood and Splash Country. 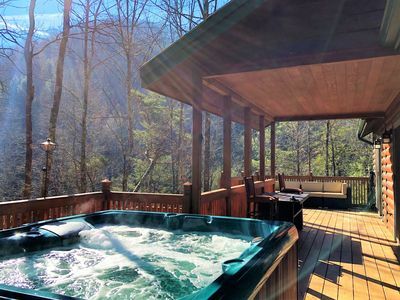 You may enjoy a hot cup of coffee from the balcony while enjoying a beautiful Smoky Mountain morning in the crisp air or enjoy the 'on deck' hot tub while watching the sun set behind the mountains. 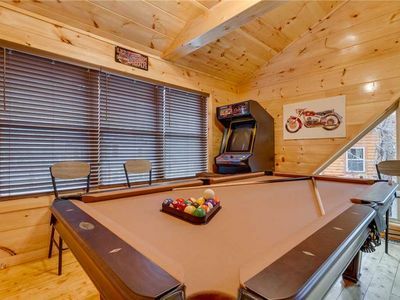 Rock your cares away on the patio-deck or enjoy playing pool right in your cabin. 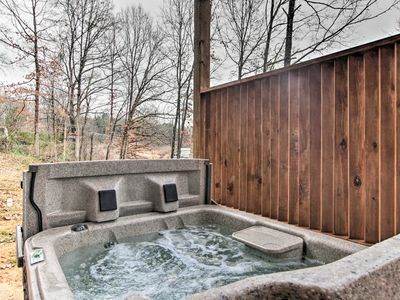 You may want to end your day by relaxing in the jacuzzi bathtub in the privacy of your own bedroom. 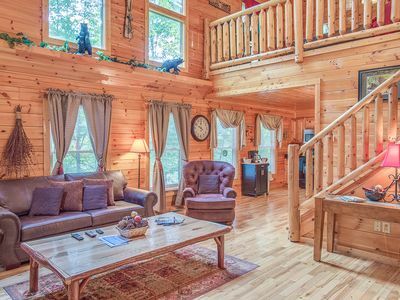 Hearts Ease is 2 BR/2BA cabin with a hosts of amenities to accommodate your stay. 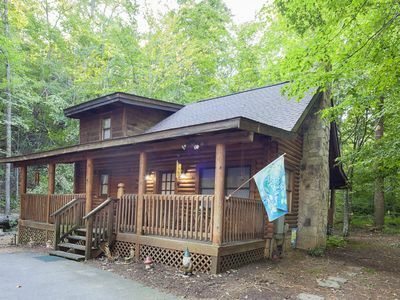 It is a perfect cabin for families or groups and has a convenient queen sleeper sofa bed that will allow two more guests to stay. 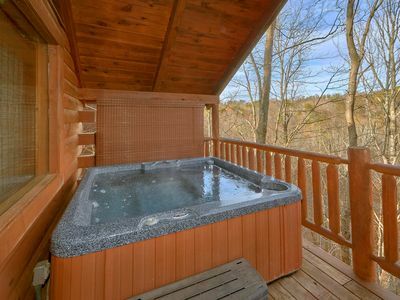 The Master suite includes a queen size bed, private jacuzzi tub, gas log fireplace and television. 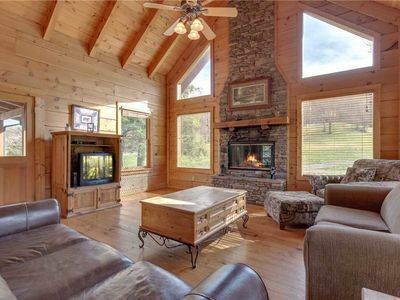 The additional room also has a queen size bed with an adjoining bathroom, private jacuzzi tub, gas log fireplace and television. Bed and bath linens are also provided for your convenience. 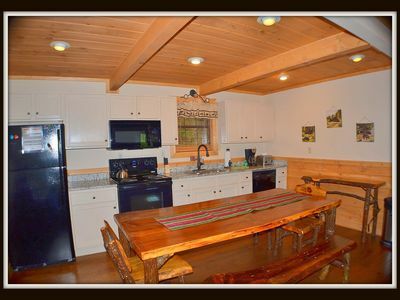 This cabin has a fully functional kitchen with stove, oven, dishwasher, microwave, toaster, coffee maker, cookware and utensils and also a washer/dryer for your use during your stay. The kitchen , dining area and living room have an ample amount of living space for your comfort. If location is key, Hearts Ease is perfect. 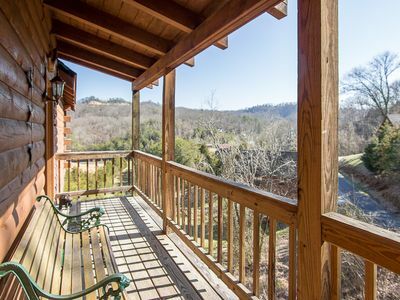 It is located one mile from Dollywood Theme Park and Splash Country but offers the seclusion of a quiet and non-crowded area. 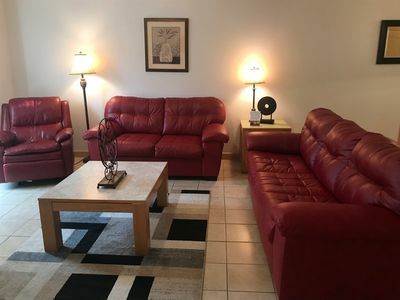 It is also convenient (just 3 miles) from the main parkway of downtown Pigeon Forge and to many recreational activities for your enjoyment including hiking, live entertainment shows, mini-gold, go-karts, restaurants, shopping malls and more. 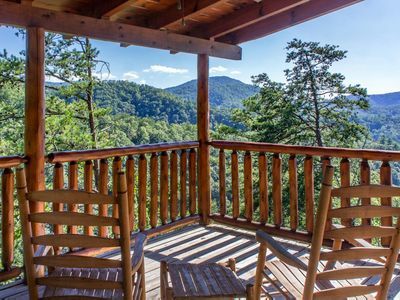 Gatlinburg is only a close scenic five miles away. New Luxury Build! 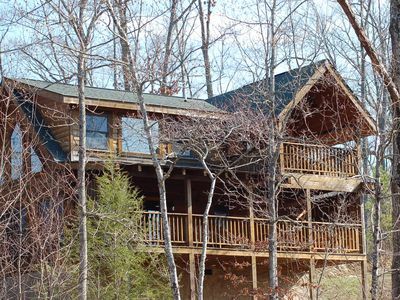 Blue Skies Cabin |Game Room | 2 New Master Suites | Pool Access | Great Location! 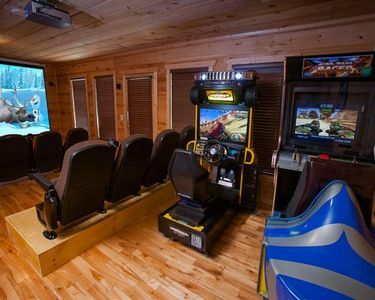 Bear Loads of Fun in Pigeon Forge #unforgettable 2 bedroom w/ Gameroom & Full Theater! ER54 - Mountain Majesty - Great location...close to all the action! 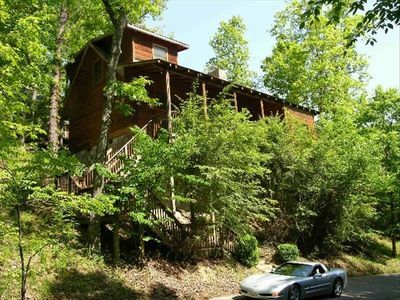 On Site Pool, Putt Putt, Golf, Fishing, Hiking & More at no extra charge!! Cabin only 5mi to town! 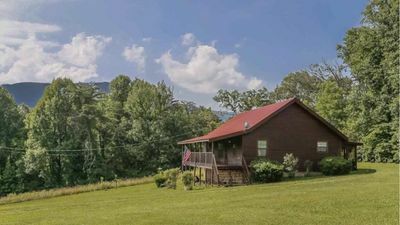 Beautiful and minutes from EVERYTHING in Pigeon Forge! 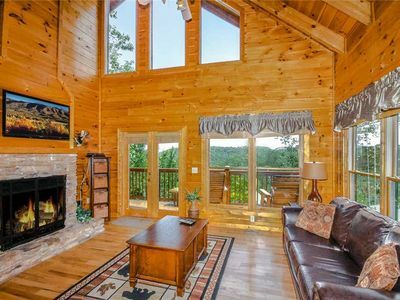 Buy 3 Nights, Get 1 Free! 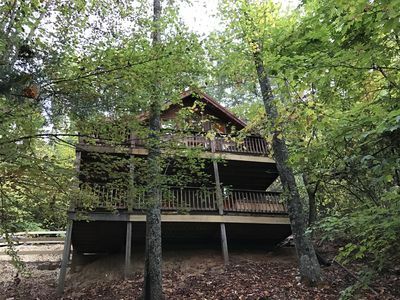 Updated Cabin!! 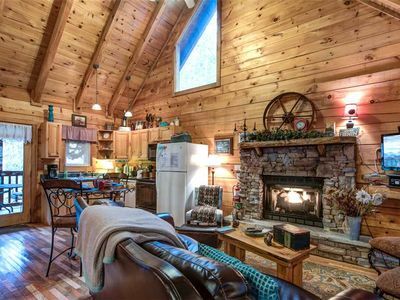 Location, Privacy, AND comfort - sleeps up to 8! 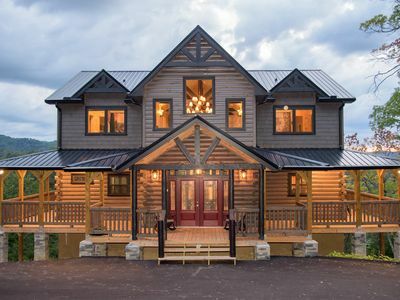 Newly Built Pigeon Forge Home - 3 Mi to Dollywood!